In the late 60s, the French 470 association organised an International Youth Criterium reserved for sailors younger than eighteen years old. This most notably enabled the arrival of Marc Bouët and the Pajot brothers to the forefront of French 470 racing however the event did not manage to attract foreign teams. The French association stopped organising the event when the French federation started awarding a French 470 Espoir Champion title in 1970, reserved for sailors under twenty-five years old. In 1978, the 470 Internationale decided to organise an international championship reserved for juniors. The access criteria were for the participants to be under twenty years old and to not have been selected to participate in that year’s World or European Championships. 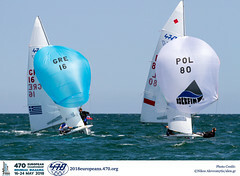 The first «Junior European Championship» was held in 1979 in Alassio (Italy) with fifty-one boats from fifteen nations. The first Champions were the East Germans Jörn Borowski/Schmidt. In 1981, this championship became theInternational Junior Championship, then Junior World Championship from 1984 in St Moritz in Switzerland. Since 1985, the winner has automatically been admitted, outside the quota, to the World Championships. In 1995, the age limit was changed to under twenty-one, then to under twenty-two from 1997. The effect on participation was immediate, it reached a record of 121 boats and twenty-eight nations in Travemunde (Germany) in 2006. In 1997, in order to reinforce its offer for juniors, the 470 Internationale created a Junior European Championship with an identical age limit. From 1999, the first women’s crew in the results table obtained the title of Women’s Junior European Champion. From 2005, as much for the Junior World Championships as for the Junior European Championships, a specific ranking was established for women by extracting their results from the final results table, but a women’s world title was not awarded due to limitations imposed by ISAF on the use of world championship titles. 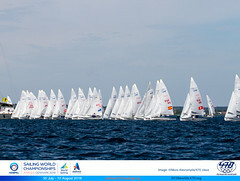 In 2006, the Junior European Championship was jointly organised with the equivalent 420 event in Tavira (Portugal). The success of this experience led to the permanent grouping of these events. In November 2007, the 470 Internationale obtained a revision of the ISAF regulations to allow the creation of a Women’s Junior World Championship. From 2008, the Junior World and European Championships all categories were split into men-mixed Junior World and European Championships and into Women’s Junior World and European Championships. At the same time, the Junior European Championships became open to all nations. As for the European Championships, only European nations and affiliated associations from the Mediterranean basin could compete for the title and two results rankings were established. Finally in November 2012, the 470 Internationale decided to no longer authorise mixed crews in Junior World and European Championships, thereby aligning these events with the «senior» championships. This policy was briefly changed for the 2014 470 Junior World Championships. 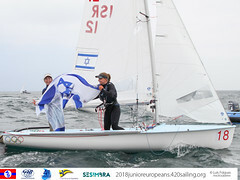 From 2015, the age limit for teams competing at the 470 Junior Championship will increase to 23 years with effect from 2015.To be eligible to compete in the 2015 470 Junior World Championships and 2015 470 Junior European Championships, the helm and crew must not have attained his or her 24th birthday before or on 31 December 2015. This increase in age limit is to help support the transition from junior to senior fleet competition. The Germans Annika Bochmann/Anika Lorenz won six medals between 2008 and 2011 of which a World title in 2011 and two European titles in 2008 and 2010, then in 2012 Annika Bochmann and Elisabeth Panuschka obtained the European title and silver medal at the Worlds. The Frenchmen Sofian Bouvet/Jérémie Mion won four titles during the period 2009-2010. The Croatians Sime Fantela/Igor Marenic won a massive haul of medals, the Junior World title in 2003, 2005 and 2007, with a silver in 2006 and bronze in 2004, as well as the Junior European title in 2005, and silver medals in 2006 and 2002. The French women Manuelle/Virginie Adam won the European title in 2003, and again in 2004 by ranking 2nd overall.